This property is partially subsidized through HUD Project-based Section 8 program for Seniors 62 or older. Studios and one bedrooms offer subsidy to qualified applicants. Single Room occupany units are rented at an affordable market rate based on square footage. If subsidy is available, you will only pay 30% of your income for rent. We hope that you will soon be calling the Stewart House Apartments at Pike Place Market your new home. Please call for details. Many people don't know it but the Pike Place Market is home to about 400 Residents who live in the historic district. 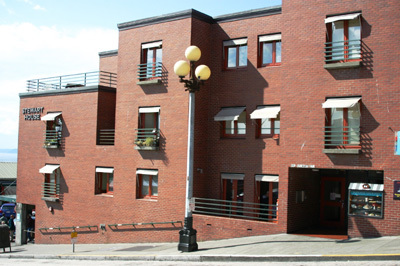 The Pike Place Market Preservation and Development Authority (PDA) has five Affordable Housing buildings located directly within the Pike Place Market. The Stewart House is located at the heart of the Market; just steps from the world famous fish guys, Rachel the pig and the ever dependable Pike Place Market clock. The Stewart House offers easy access to the Market's many businesses, the newly located Pike Market Senior Center, Downtown Foodbank, the Pike Market Medical Clinic and all major buslines. Income Limit Details: HUD extremely very low and very low limits households for the subsidized units. This property is partially subsidized through HUD Project-based Section 8 program. Studios and one bedrooms offer subsidy to qualified applicants. Single Room occupany units are rented at an affordable market rate based on square footage. If subsidy is available, you will only pay 30% of your income for rent.